I have made another sketch for you for the sugar bowl challenge, I always like all the different kinds of cards there are made with 1 sketch. As always, you must include a Sugar Nellie stamp.You may rotate, re size or elongate the sketch, you can even make something other than a card, all that we ask is that we can see that the item has followed the sketch. One lucky winner will receive 6 super sweet Sugar Nellie stamps, of their own choice. So whether you would like one of the new stamp collections or just a bit of this and a bit of that, the choice is yours! This is what I've made with the sketch! This lovely the papers and colours are very pretty, great sketch too. I love the way you did the sketch! I may have a try:-) wonderful job!! Zo mooi weer Tiets, lieve kleurtjes en je sketch was weer fantastisch! Ik vind de kleurtjes erg mooi en het kaartje is natuurlijk ook weer prachtig wat je hebt gemaakt. Eine wunderschöne Karte. Ich liebe die Pastelfarben. wat een schitterend kaartje Tiets. your card is great, love it. Your sketch is fabulous as always, as is your creation following it! Wat is het weer een geweldig mooi kaartje.... super!!!! Oh what a wonderful card!!!! Tiets! Your card sketch's the best and your card's just lovely! Love it!! Thanks for the inspiration! :) Have a great day! Thanks so much for the gorgeous sketch Tiets!! I absolutely adore your card as well! The colors are so pretty together and go fab with this image!! Of course all your details are beautiful!! your card is soooo pretty. i will give this sketch a try!!! Wat een prachtig kaartje weer Tiets :D! Schitterende kaart en gave sketch Tiets! Love this sketch and your card is beautiful. 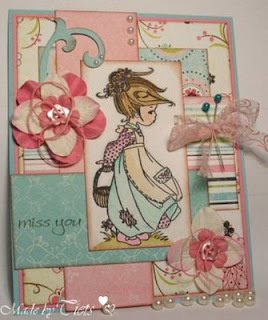 Love the soft colours you have used and the image is coloured perfectly. Think I will have a try at this sketch. This is beautiful! Love the soft colours - those papers are so pretty! Thanks for a great sketch too! Beautiful card and gorgeous colors! Beautiful card. Thanks for the sketch loved it. First timer here but I'll be back. Prachtig kaartje een erg inspirerende sketch en wat een gaaf papier heb je gebruikt!